1100 620 720 195 1/2 "
1100 620 720 200 1"
1100 620 720 220 1"
800 650 1000 300 1"
800 650 1000 350 1"
1470 1000 1140 505 1 ¼"
1470 1000 1140 550 1 ¼"
1470 1000 1140 610 1 ¼"
1470 1000 1140 695 1 ¼"
1650 1600 1480 1050 1½ "
Screw type, oil-injected air-end, with asymmetric high-efficiency rotor profile, with massive bearing construction, ensuring highly reliable, continuous operation. Electric motor, standard metric frame, three-phase, class-F insulation, 400 V-50 Hz, IP23 drip-proof enclosure (TEFV IP55 enclosure is standard up to 75 HP). Motor starter, Star-Delta type, with motor overload protection. 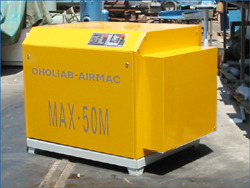 Air-cooled aftercooler, cooling the compressed air to about 10˚C above ambient. Dry type, air inlet filter. Lubrication system, complete with air-cooled oil-cooler, oil filter, safety valve, oil level gauge, interconnecting piping, thermostatic mixing valve enabling stable operating temperatures . Fine air-oil separator, two-stage, ensuring 1 to 3 PPM oil-carryover (by weight). Control panel, including pressure gauge, temperature gauge, filter service indicator, hour-meter, fault indicating lamp, start/ stop / reset switch (on compressors of 60 HP and above, MAXTRONIC electronic control panel is standard - see options below) . Acoustic canopy, for the reduction of the noise level down to 76 to 82 dBa (standard up to 30 HP). Motor starter Options - Soft Starters, Digital or analog types ,Vacuum switch contactors Compressor Cooling Options - Air cooled, water-cooled, stainless-steel or titanium coolers. Silencing Options - Non-silenced (Open type) and silenced compressors. 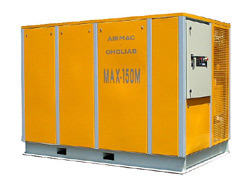 Combined Capacity Control (Upper range Modulation) down to partial capacities of 50% (adjustable ), unloaded run with automatic timed-stop and auto-start on renewal of air demand. Power Saving "TURN-VALVE" Control, with the stepless reduction of the effective length of the rotor proportional to air demand, ensuring minimum power consumption at part-load. One of the simplest and most efficient capacity controls in rotary Air compressors, from 100% down to 0% flows, for plants having large fluctuations in compressed air demand, with up to 20% saving in power costs. Variable- speed capacity controls - Stepless reduction of flow at constant pressure is achieved with the stepless reduction of the motor speed by frequency variation, realizing a proportional saving in power. 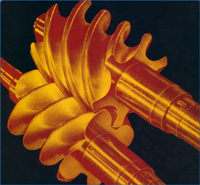 Filtration options: Centrifugal Turbo-prefiltration, for high dust-laden environments. Local control panel options: "MAXTRONIC" Digital Control Panel, with digital readout of pressures, temperatures, total-run and on-load run-hours, alarm and shutdown LED's for high-temperature and pressure, shutdown LED's for motor and fan overload, service schedule announcement for each periodic maintenance function, optional alarm and fault LED's for air & oil filters, oil separator, low-oil level. Comprehensive, user-friendly compressor control. Remote control options: Compressors can easily be wired for capacity control from remote location, manually or by remote digital controller. Multi-compressor controls: Sequencers to control any number of screw or other type of compressors coordinately and with minimum total-power consumption. Technically oil-free air options: "TECHNICALLY OIL-FREE "air compressor sets, with microfibre air/oil separation, reducing the oil content down to 0.003 PPM oil residue. 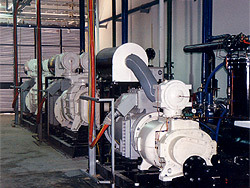 Special skids and packages: Compressor / Refrigeration or Dessicant dryer / microfibre separator /control packages, fully factory piped & wired, on one or more skids.